This webinar will introduce clinicians to the Pathways 4th Edition workbook. 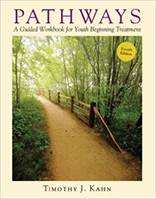 The author will review what he has learned in 26 years of clinical use with Pathways, and he will provide helpful ideas and tools that will help clinicians use the workbook effectively in their programs. You can access the handouts from this presentation here, here, here, here, here and here.